OBSERVE AND FIGHT: IS PACQUIAO A PUPPET IN ARUM'S WORLD? It's Monday. Welcome back for another edition of Observe and Fight, The Boxing Observer's compilation of observations and random thoughts from the week that was in boxing. Get caught up on some of the most recent events you may have missed out on, including the controversy surrounding Manny Pacquiao's financial situation, the IBF ordering a rematch between Agbeko and Mares, Alfredo Angulo's successful return to the ring, and much more. Without further ado, check out the latest observations from The Boxing Observer. Manny Pacquiao is a puppet in Bob Arum's world. Is "PacMan" even capable of thinking for himself? I know he has a lot on his plate: boxer, musician (sort of), actor (sort of), politician (okay, I'll give him that one...sort of), but why are we hearing all these reports of him being broke? The man has supposedly made over $50 million in purses in his career. I know he likes to travel with friends, but isn't there somebody in his circle that can take him aside and tell him what's up? Does anyone else feel like they could walk up to Pacquiao right now and immediately become part of his crew? Manny, a little piece of advice, take a look at Mike Tyson and Evander Holyfield. "Iron" Mike was the most popular man on the planet at one point and pissed it all away. Holyfield still has to fight at 48 years old because he needs a payday. Don't make the same mistake! Nobody wants to remember you that way. It will be interesting to see how much revenue Manny Pacquiao can truly generate on November 12th. The UFC and Fox will being going head-to-head with Pacquiao in November. I guess we now know that UFC president Dana White thinks Floyd Mayweather is a bigger draw than Manny Pacquiao. If you remember, it was White who moved his Pay-Per-View card up by one week in 2010 so he wouldn't have to compete with Floyd Mayweather's fight with Shane Mosley. Kudos to the IBF for ordering an Agbeko-Mares rematch! And kudos to Mares for immediately saying he would gladly fight Agbeko again within the 120-day mandated timeline set forth by the IBF. The fight was entertaining, with or without the low blows. Let's get this thing made and see who the champion really is. I just wish Mills Lane was still around to referee fights because he wouldn't take any crap. "The Judge" is the only man I have ever seen who looked more intimidating than Mike Tyson standing in the ring. Not bad for a 140-pound old, bald guy. The return of Alfredo Angulo was a complete joke! Angulo landed 2 body shots that sent Joseph Gomez to the canvas. We learned nothing new about Angulo after a 13-month layoff. The only thing we know is he should be able to fight again this Saturday. Hell, he's already in shape, didn't get hit with any punches, and barely broke a sweat. But I'll bet Golden Boy sure is happy after getting a huge crowd in Mexico. Joseph Gomez should fight Likar Ramos in a "Loser Leaves Boxing" match after the disgraceful showing from both fighters in each one's last bout. How soon will Golden Boy put Saul Alvarez in the ring with Angulo? My guess, not anytime soon. Assuming "Canelo" can get by Alfonso Gomez on September 17th, it makes perfect sense to pit these two warriors against one another. Only problem is Golden Boy would be taking a risk matching its prized possession with a fighter like Angulo at the ripe old age of 21. 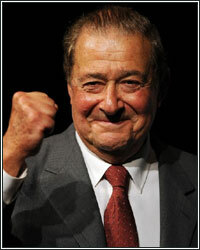 Let's hope Richard Schaefer and Oscar De La Hoya give the fans what they want and get this done. As recent history has shown, however, don't hold your breath. Victor Ortiz's back is just fine. Don't let anyone fool you. The news last week of "Vicious" Victor's back injury is nothing more than overwork. Everyone needs a day off to rest from time-to-time to avoid blowing a gasket. Unless something devastating happens between now and September 17th, we will see a Mayweather-Ortiz showdown. Fighters work through pain all the time; they just don't talk about it. Right David Haye? Don King turned 80 years old this past Saturday. Say what you will about Don "Only in America" King, but he may be the most famous man never to lace up gloves in ring. He remains the most recognizable figure in the sport, and while he doesn't work as hard as he used to (who can blame him at 80), he still knows how to promote a fight. Robert Guerrero just can't catch a break. Guerrero's scheduled fight with Marcos Maidana this Saturday was called off last week after "The Ghost" sustained a serious shoulder injury. It's a shame because the fight would have produced some serious fireworks. What else will this guy go through in his career? His wife battling cancer twice, plus a bone marrow transplant, and now this. Guerrero is one guy in boxing everyone should root for, and I hope to see him back in the ring sooner rather than later. Antonio Tarver is a smart businessman, but I wish he would make a stupid decision. While I understand Tarver is 42 and doesn't want to fight for nothing, I would love to see him battle Steve Cunningham in an all-American cruiserweight title fight. If Danny Green does not exercise his rematch clause, the fight would generate some much needed interest in the cruiserweight division and prove who the best in the world really is. HBO or Showtime should pony up the dollars for this fight because it wouldn't disappoint. After all, if HBO can shell out guaranteed millions for Andre Berto, it can certainly afford to do this. That's all I've got for now. Send your questions/comments to dkassel@fighthype.com, be sure to "Like" The Boxing Observer on Facebook, and follow me on Twitter @BoxingObserver.